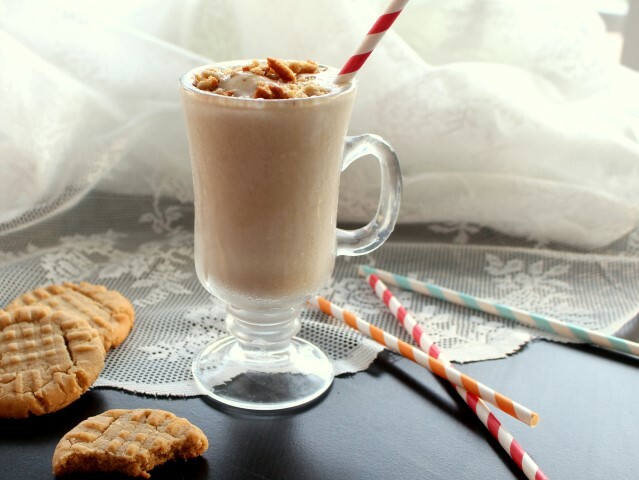 A thick vanilla milkshake featuring all the peanut buttery goodness of the classic cookie! This milkshake is AWESOME!! Like, the best one I’ve ever had! I don’t know how else to describe it. Oh I suppose I could launch into an elaborately detailed discussion about the the heavenly texture of the peanut butter cookie, the oh-so beautiful flavor of the vanilla ice cream, and the wonderful marriage of the two together in this desert, but it’s just plain yummy. The end. So instead of preaching the glories of this milkshake, (because I already know all of you are gonna try it. Who can resist a milkshake like this?) I’ll fill you in on a bit on my life. Life has been a bit chaotic the past couple of weeks. Lots of awesome summer plans, company and I’ve started taking this blog a bit more seriously. It’s is a lot on top of a full time job, but I love it. Being productive and involved makes me a happy camper. I’m learning to make every minute count. To help me accomplish that I’m going to post a list of my summer goals. (Something I probably should have done two months ago.) You can help keep me accountable, look for a report on my success/failures in a couple months. Post at least three times a week. Its going to be a challenge, but I have been getting more efficient and have been dedicating more time to it and recipe development is my favorite! Learn how to take pictures in manual mode on my new camera. I’m loving the pictures my camera takes and am excited to take it to the next level. Create a blog organization system. This is a daunting one to me, but absolutely necessary for me with my time budget. If you have any tips for me on this one, I would love to hear them. Memorize at least 10 new Bible verses. Since I’ve started my new job, life has been crazy. I need to make sure, I’m spending quality time in God’s word. Slowing down to actually memorize verses has always been a good way for me to digest and apply them to my life. I would love to hear about your favorite verses. Host company at three or four more times. I appreciate my friends and family so much and want them to know that. Eat more vegetables. This may be the hardest item on my list. I have a genuine desire to complete every other goal on my list, but this one will be a struggle. I just plain don’t like them, but they’re good for me and so abundant this time of year. So, send my your favorite veggie recipes. Hopefully I didn’t lose you all with my plain ordinary life goals. Nothing to grand or glorious, but I’ve been learning to enjoy all the little moments and successes. Just one more little bit on my favorite milkshake ever. Choose your favorite peanut butter cookie for this recipe (I love this classic recipe from JIF. ), and your favorite vanilla ice cream. I have made these with several kinds of ice cream, once using raspberry swirled ice cream and they all have came out delicious. The one I made with raspberry ice cream reminded me of a peanut butter and jelly sandwich. So use your creativity. Place all ingredients in a blender and blend just until smooth. 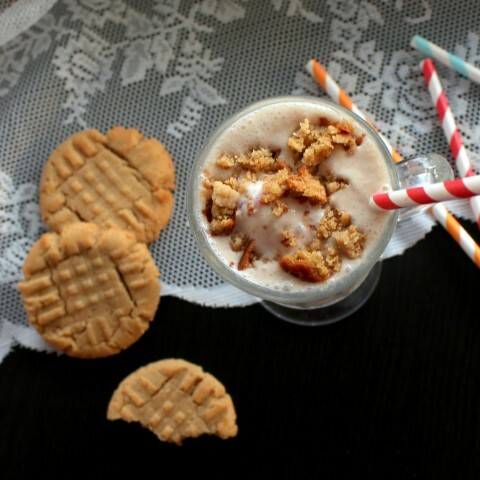 Pour into a glass and top with more cookie crumbles and a cute straw. Enjoy. 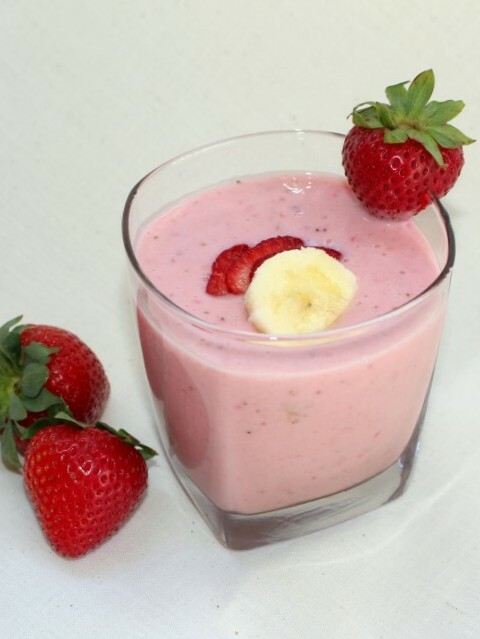 If you want a healthier milkshake treat, try my healthy strawberry banana milkshake. LOVE this milkshake and love your goals. It’s not easy to keep up with a blog is it? But you are doing an amazing job! Thanks, Matt. I’m enjoying every step of it. What a wonderful milkshake Mallory!! And awesome job on listing your goals. If you figure out a blogging organization, please let me know! Memorizing 10 verses 🙂 Love this!! Good luck! Thanks, Serene. Only if you promise to share your organization secrets if you get it figured out first. Love your goals and that you posted them! Thanks, Taylor. Hopefully you guys can help keep me on track. What’s NOT to love about this milkshake?! This might just become my fav milkshake too. I love anything peanut butter, so of course I love PB cookies. Mix them with ice cream…ROCK ON!! It’s so easy there’s no reason not to! Thanks for stopping by! 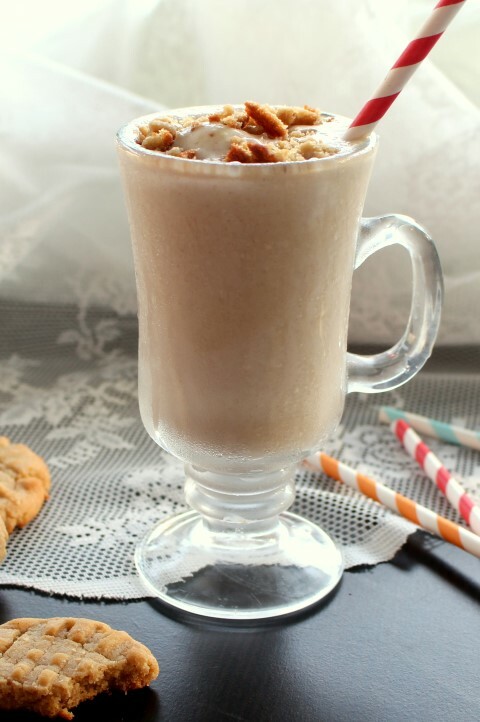 I just LOVE peanut butter milkshakes. I think I could have this for breakfast! This milkshake sounds amazing and I can’t wait to give it a try! Best of luck to you with your goals. I’m totally with you on a lot of them- I wish I could get on top of some of those things too! Thanks, Allie. I hoping some accountability helps. Looks like a perfect summer milkshake! This looks amazing! I wish I was sipping one right now! Yes, Cookie Butter is one or my favorites! Thanks for stopping by!